If you’ve ever wanted to get into carving, or if you are an experienced carver and you want to add to your tool collection, Highland has a great deal for you, courtesy of the Flexcut Tool Company. 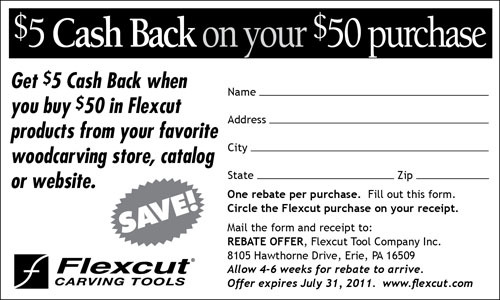 If you buy any Flexcut tools totaling $50 or more, you get $5 cash back. If you spend $100 or more, you get $10 back! It’s that simple. And these rebate coupons are valid through 7/31/2011. If you are just starting out, check out the 5-piece palm chisel set – a great collection of tools for the novice carver. If you are beyond beginner, you might want to upgrade to the 11-piece craft carver set. 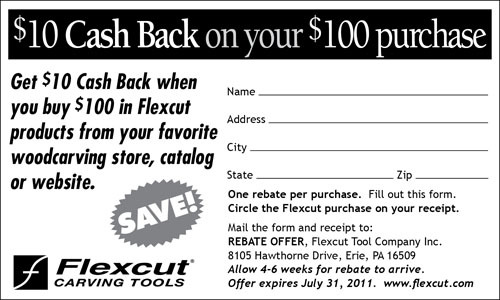 Check out the Flexcut rebate on the Highland Woodworking site, or scroll down to see the coupons. Flexcut carving tools available at Highland Woodworking.